Crocheting is fun because you get to learn a variety of textures based on the content of yarn you used. And through the years of my crafting, I have accumulated a number of stash both given by my friends and purchased from my own money. 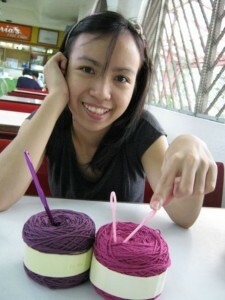 My favorite is still the ‘soft cotton yarn’ from Indonesia from an online store www.craftandme.com. My Indonesian friend offers a variety of yarns from cotton, mohair, wool, rayon and plastic yarn. I still have a lot of mohair and bulky soft cotton yarns on my stash in two balls or more and they are all scattered everywhere in the house. I have to pile them up properly so I can take a decent picture of all of them together. Though my supplier tells that the yarn weight depends on the supply, I prefer most the lighter weight yarns I got from her a few years back. As a testament to this, almost all my lighter weight Soft Cotton Yarn were used up and I am still itching to replenish my supply but this lead me to another discovery of getting my supplies from Turkey’s online store – www.yarn-paradise.com, which offers a lot of variety when it comes to yarn content and yarn weight. Recently I have made two separate purchases at www.yarn-paradise.com. I have finally found a decent lace-weight yarn to work on for a dress. I have been wanting to make a dress but all my previous attempts were not so successful because the yarn tends to make the whole dress bulky and heavy. My Ice yarn stash compose of three metallic yarns – green, silver and gold. One alpaca, merino blend, one mako cotton tape yarn, one cashmere-silk blend. All in all, they are luscious and lovely (except for the tape yarn). Since I prefer lighter weight yarns, working with tape yarn is a bit disastrous for me since they create big stitches. And this is the craziest purchase ever when I attempted to sell yarns three years back. I bought a huge amount of these feltable wools in China. I sold a lot, mind you, but there came a time when I just want to hoard them all because of the lovely colors. They used to sell at P300 per 100g and P140 for the smaller cones. To achieve the right felting, you have to wash the finished project a number of times so that the yarns would start to ‘bloom’. This takes hardwork and I let mine be felted through repetitive usage, over time. My most expensive yarn is the 100% cashmere that cost my husband approximately $21 each hank. He bought me three and they are on its way to become a small jacket. And I also have another story where I met a Singaporean dudette named Janice, online and became friends with her. She sent me nice yarns too. I love surprises containing yarns. I was really happy everytime some friends send me yarns throughout the country. Take Jen, my husband’s close friend from Germany who sent me a lot of yarns I had never had before. They were all luxurious and beautiful. I really love them a lot to the point I cannot dare to use them because they will be gone and I will be sad. And I also acquired a huge lot of japanese yarns, a fraction I already gave away. The baby yarns and boucle yarns are gift from my org buddy, Loren. I think she’s one loyal reader as she loves me and posts comments on my blog a few times. I was surprised one day that a package came containing those yarns. Another friend, cheska from Physics sent me a number of Jelly Bean Yarns which I was supposed to make into pillows. I never finished them though. My bestfriend Mylein gave me three big hanks of yarns. The biggest I have ever seen in my life. I used up the third ball of yarn to include in my baby blanket but the two other yarns are reserved for incoming baby girl if I will ever have one. That is what Mylein told me. And then I have lots of pink yarns. Each yarn has a different story. Most of these unique yarns came from Jen. See the plastic yarns? They are from indonesia. They are lovely. And of course, as a Filipino, I started crocheting using cotton yarns from monaco and canon. And I actually have some unused balls. They are the staple yarn here in the Philippines. My nanay also gave me lots of bulky cotton threads from Saudi Arabia. I haven’t found the last lot she gave me, I knew it’s somewhere around the house. I hope to finish tidying my room up in a few weeks time since I am planning to weave baskets to house them. I managed to tidy up four boxes but there are still a lot more I need to do. This entry was posted in Yarn on November 16, 2012 by Lorelie Dazo.